We can use rsinaica to find out which city is the most PM25-polluted in all of Mexico. Then we download the data for the whole year of 2017 using the sinaica_param_data function. Since the maximum data range we can download is 1 month, we have to use a little mapply magic to download the entire year. I thought there would be a few cities that collected PM25 data manually (they collect it through a filter and send it to be weighted to an external lab, sometimes in another country). But no air quality station collected manual PM2.5 in 2017. Once we’ve downloaded the data we filter values below 1 µg/m³ since they’re probably calibration errors. And we only include stations that reported for more than 80% of days (292). 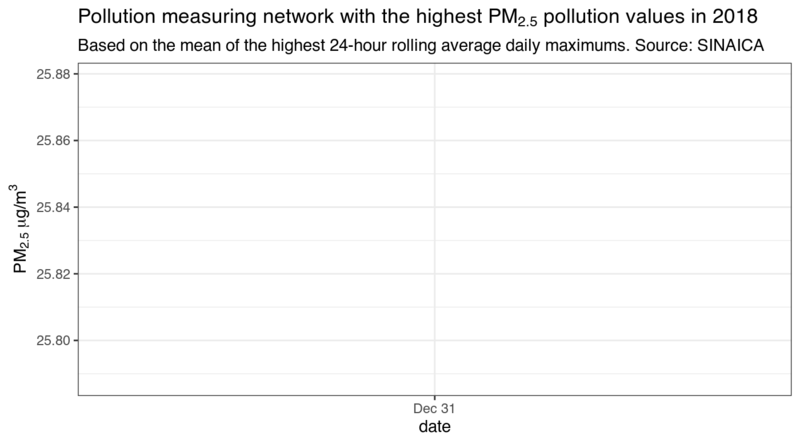 We also have to take into account that PM25 data is measured as a 24 hour average. When plotting the daily 24 hour average maximums we can see that there are still some obvious errors in the data. It looks like we can safely remove values above 200 µg/m³ and get rid of the Aguascalientes, Irapuato and Monclova networks. We can also use the anomalize package to detect extreme values, but actually figuring out if they are errors is a little bit more tricky since fires can temporarily spike PM25 levels as often happens during the winter holidays when people burn trash and tires, and set off fireworks. I’ve opted not to remove them, because of the spikes around new year. Since I’m interested in the average of the whole year, these PM25 outliers are unlikely to have a substantial effect on the rankings. It was decided to remove Irapuato from the rankings and keep Tepic because PM2.5 values can spike because of fires. Normally I would have removed Mexicali since it didn’t report any correct data during the winter season, but its levels of PM2.5 where so high that I decided to keep it. The top 3 most PM25-polluted cities in Mexico. Note that Mexicali didn’t report any data during the winter, which is the season with the highest levels of PM2.5 pollution, it could probably have ranked higher if they bothered to keep their instruments working. title = "daily maximum 24 average of PM2.5"
Number of days with very bad air quality (Índice IMECA MUY MALO).